When YouTube launched the feature that shows a filmstrip of thumbnails when you mouse over a video, it only worked in the Flash player. Now it's also available in the HTML5 player. Unfortunately, the HTML5 player doesn't support yet the second seek bar for videos that are longer than 90 minutes. It's nice to see that YouTube's HTML5 player supports almost all the features of the Flash player and looks just like the Flash player. 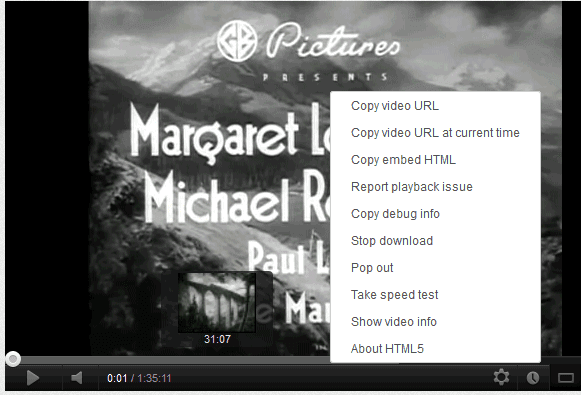 If you uninstall or disable the Flash player, YouTube automatically switches to the HTML5 player, assuming that you have a browser that supports the video tag. Obviously, you can still manually switch to the HTML5 player. The Lady Vanishes? Excellent film! Yes, but why HTML 5 don't support 240p ?